TIFF Bell Lightbox, the home of the Toronto International Film Festival, contacted me a few weeks ago and asked if I would write about an Ingrid Bergman film as part of their “Notorious: Celebrating the Ingrid Bergman Centenary” event. Of course I said yes! I am thrilled to be involved in this celebration of such a legendary, luminous star. The TIFF retrospective runs from August 22 to September 6–so stop by if you can! Ingrid Bergman was born in Stockholm on August 29, 1915, and died on that same date in 1982. She had an extraordinary career and a fascinating life, and she left us with many incredible films. 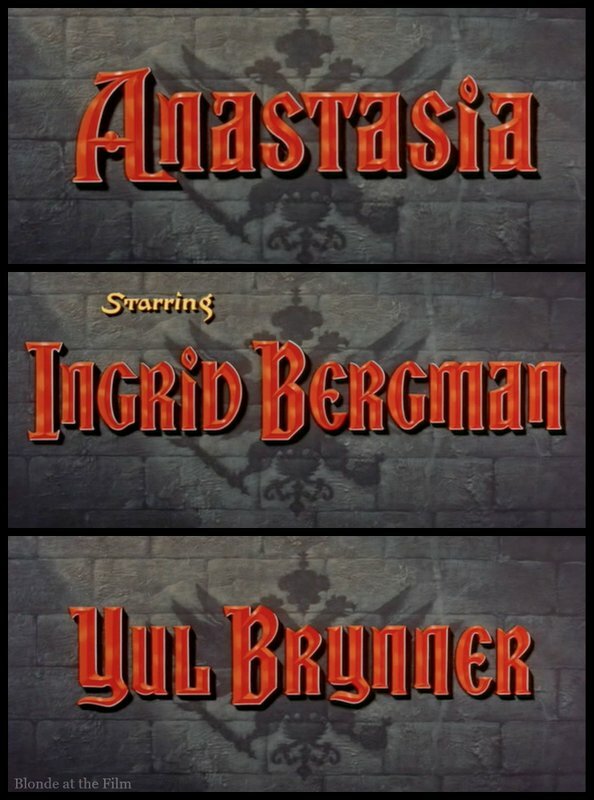 I’ve written about Gaslight (1944), Spellbound (1945), and Notorious (1946), and for the TIFF Bell Lightbox retrospective I chose Anastasia (1956). 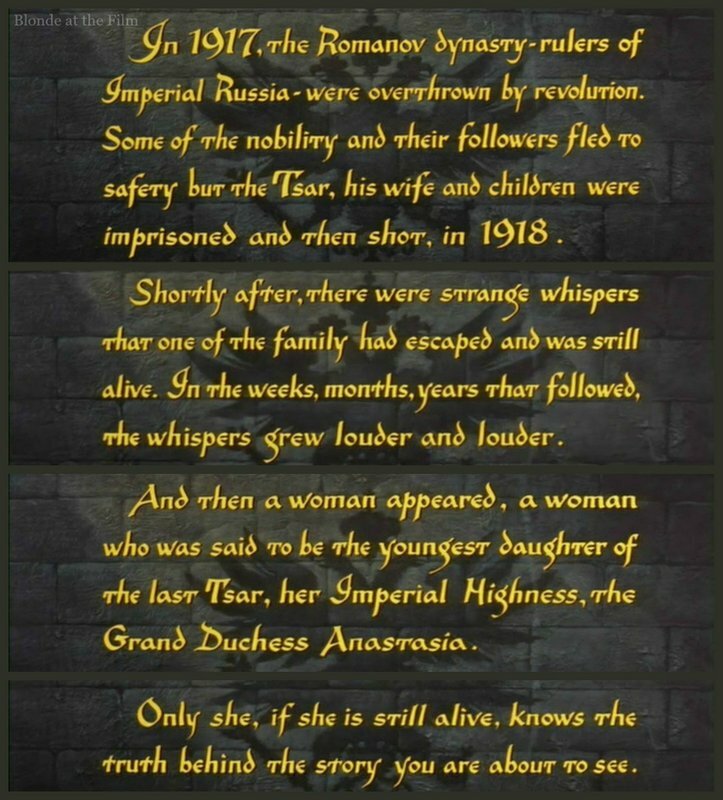 via: http://www.doctormacro.com/Movie%20Summaries/A/Anastasia.htm Unless otherwise noted, all images are my own. It’s a great movie about an infamous subject, but it’s also interesting because it marks Bergman’s return to Hollywood after her scandalous affair with Italian director Roberto Rossellini. In 1949, after appearing in such classics as Casablanca (1943), For Whom the Bell Tolls (1943), Notorious (1946), and Joan of Arc (1948), Bergman went to Italy to work with Rossellini on Stromboli (1950). Bergman and Rossellini were both married to other people, but they fell in love and had a son in 1950. 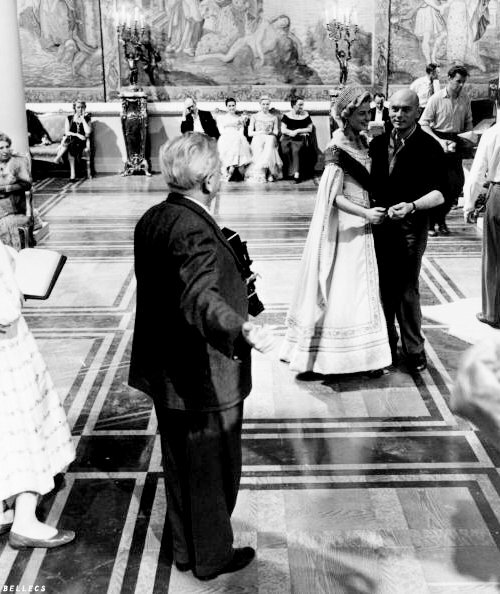 Meanwhile, Bergman stayed in Italy with Rossellini, whom she married in 1950. She starred in four more of his films, and they had twin daughters in 1952 (actress Isabella and Isotta). But Hollywood seemed off-limits, as anger at Bergman simmered away. It seems astounding today that an affair could derail a career as strong as Bergman’s, but she was a special star in a different time. But as we’ll see, audiences forgave and forgot. 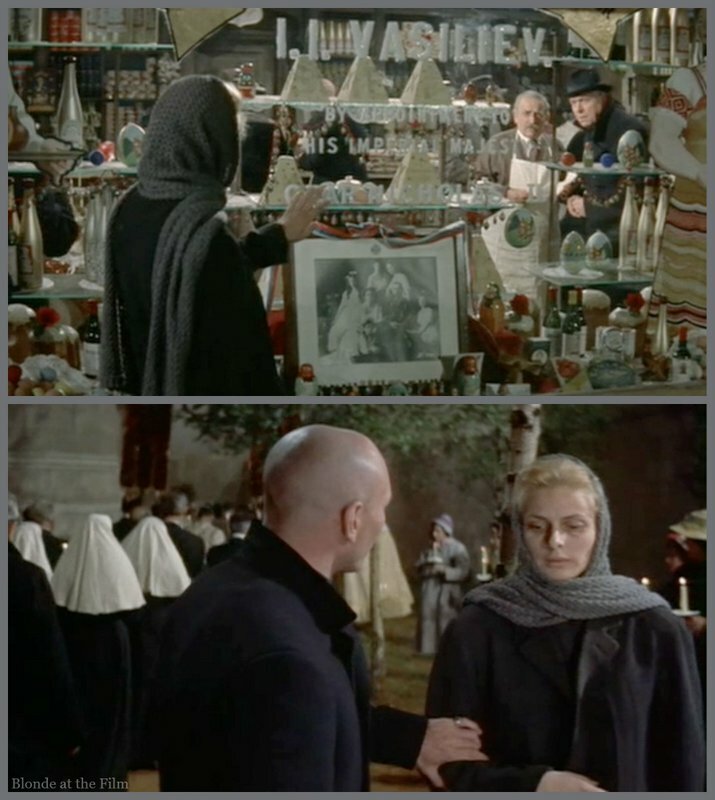 Bergman would later famously remark that her reputation had swung “from saint to whore and back to saint again,” though it took nearly seven years for the pendulum to move back to “saint.” And Anastasia was the movie that pushed it along. This film tells the story of a notorious legend surrounding the murders of the Romanov family. The Tsar (I’m using that spelling because the film does), his wife, their children, and four servants were executed in a cellar by the Bolsheviks after the Revolution in 1918. But rumors soon circulated that one of his daughters, seventeen-year-old Anastasia, had miraculously survived. Many women came forward after the massacre and claimed to be the lost Grand Duchess, last surviving member of the Romanov dynasty and heir to a substantial fortune. The most famous of these “Anastasias” was a woman named Anna Anderson, who began claiming that she was the Grand Duchess Anastasia in 1921 while in an asylum in Germany. Anderson became something of a celebrity, and gained enough support to meet with remaining Romanov relatives, some of whom believed her and some who did not. Anderson initiated a lawsuit in Germany in 1938 to prove her identity and thus allow her access to the Romanov inheritance. It was the longest running suit in German history, and finally ended in 1970 when the courts ruled that Anderson had not proven her case. I’ll give you more on Anderson and the saga of Anastasia at the end of the review. Anderson’s story inspired Marcelle Maurette’s play “Anastasia,” which was adapted by Guy Bolton on Broadway in 1954. 20th Century Fox bought the film rights and hired Anatole Litvak to direct. Fun fact: Litvak was born in Kiev, and spent much of his early life in St. Petersburg before fleeing Russia in 1925. Fox wanted Bergman to play the leading role despite the potential risks inherent in starring the “fallen” actress. She’d been absent from American screens for seven years, but Fox head Darryl Zanuck and producer Buddy Adler took the chance. Lucky for us, Bergman accepted the part! 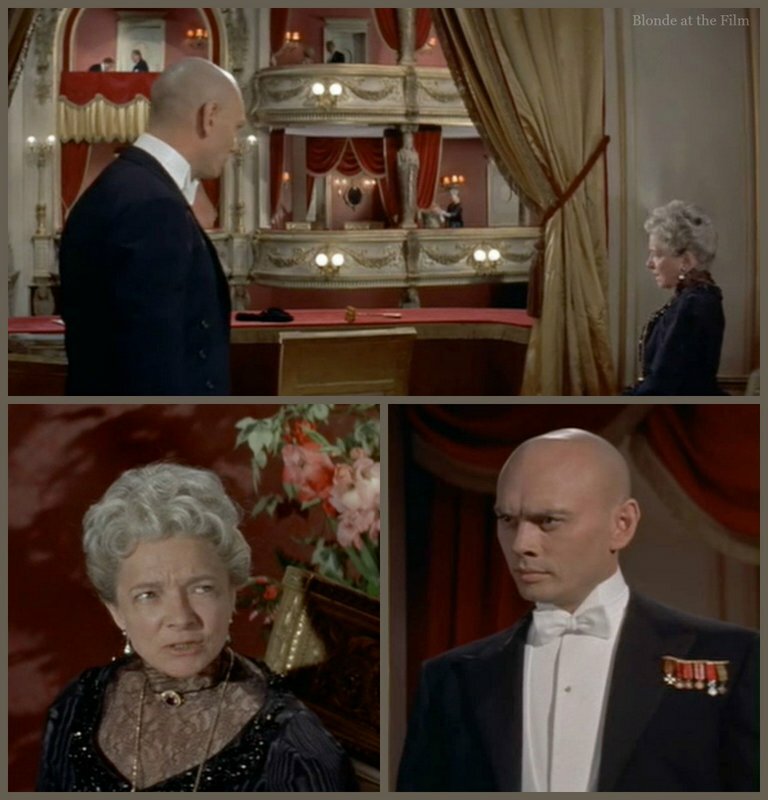 Yul Brynner, who was filming The King and I (1956) at the time, agreed to play the White Russian General Sergei Bounine. 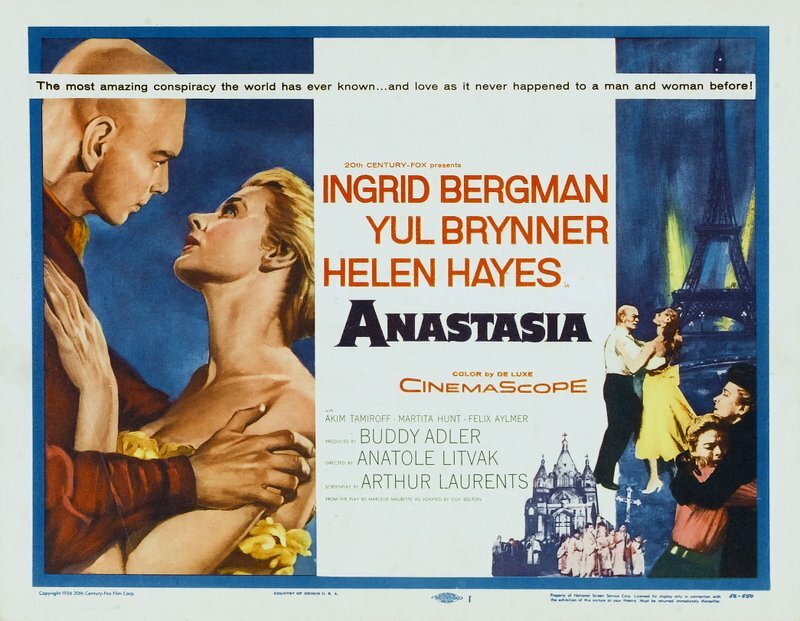 Appropriately enough, Brynner was born in Russia, as were many of the other actors in the film. 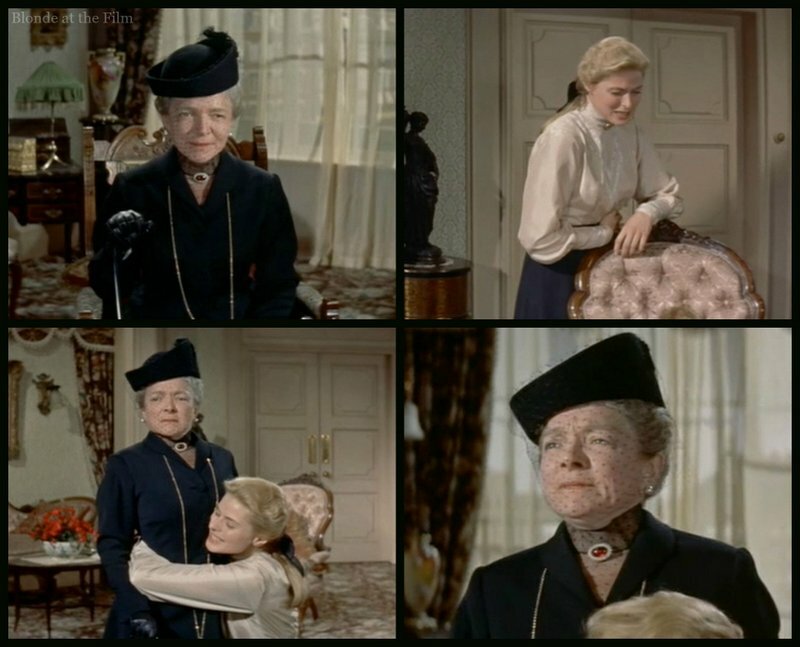 The final big role went to Helen Hayes, “The First Lady of American Theater,” who came out of semi-retirement to play the Dowager Empress Marie, Anastasia’s paternal grandmother. Fun fact: Hayes is one of only twelve people to win the coveted “EGOT,” an Emmy, Grammy, Oscar, and Tony. 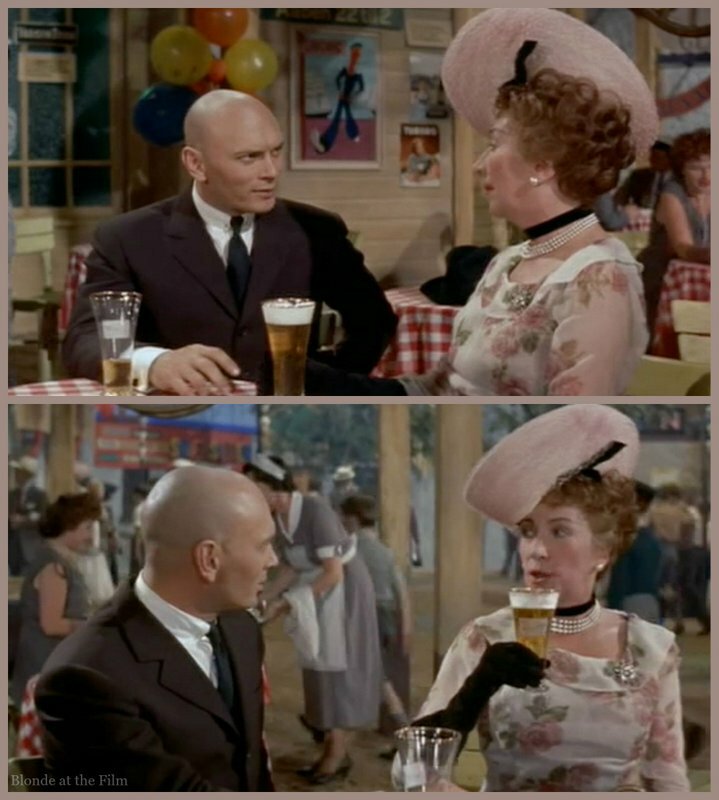 Bounine (Yul Brynner) approaches and asks her if she is the woman who told the nuns in a German asylum that she was the Grand Duchess Anastasia. The woman looks terrified and flees. Bounine follows from a discreet distance. The whole mysterious scene is played with the Easter procession filing from the church behind them, while soaring music from the choir fills the air. It’s a great juxtaposition between this odd, sickly woman, these unknown men, and the formal beauty and sanctity of the service. Alfred Newman composed the score for this film, and though at times the music feels melodramatic (as does much of this film), it usually works brilliantly. You can listen to it here. Fun fact: he was nominated for an Oscar for this film, but he lost to Victor Young’s score for Around the World in 80 Days (1956). Another fun fact: the production requested permission to film this scene at St. Alexander’s Cathedral, a Russian Orthodox church in Paris. But the church said no, so the crew took still photographs of the cathedral and then built a version of it on a soundstage in England. Back to the film! The woman rushes down dark Paris streets, clearly terrified at being followed and discovered. She seems ill and keeps coughing as she tries to disappear into the shadows. 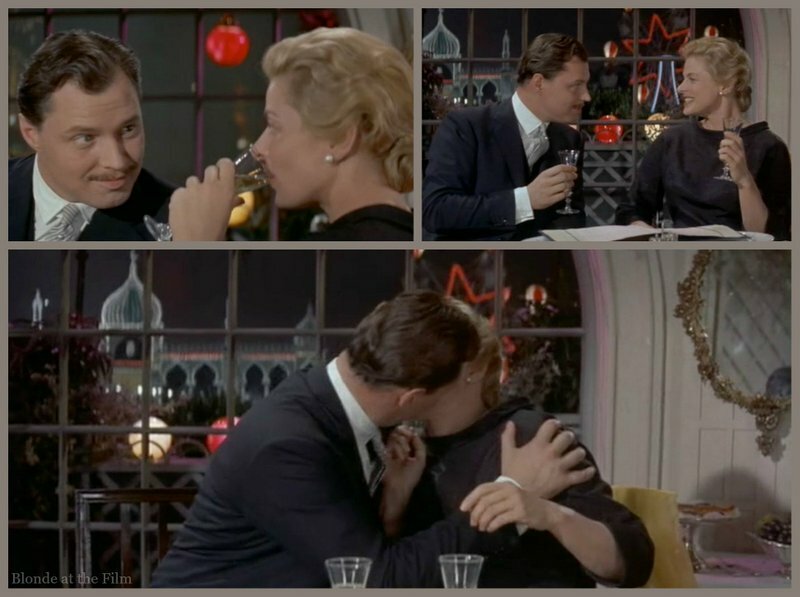 These scenes were filmed on location in Paris in early summer, 1956. …but a man pulls her back at the last moment. Bounine, of course. Cut to a cellar where two Russian men discuss a scheme they’ve been running to find Anastasia, or at least someone who can impersonate the Grand Duchess and gain access to her ten million pound fortune held by the Bank of England. They’ve been selling stock in the proposition to finance their efforts, but the money is running out and their shareholders are not happy. Bounine enters but doesn’t tell his partners that he has found the woman from the German asylum. (How they heard about her in the first place is never explained.) The three men discuss their situation and the rumors of Anastasia’s survival for a while (it’s basically a long scene of exposition for the audience). Then Bounine summons the woman he saved from suicide. She says her name is Anna, and we learn that she’s an amnesiac who is clearly unwell, both physically and mentally. Bounine looks at her piercingly, but he lets the moment pass. Anna says that the scars might be from bullets, but they might be from a train explosion. She can’t quite remember. Her amnesia covers almost all of her life, and she has no idea who she is or what her life has been. They just want the money, and they’re interested in Anna because she resembles Anastasia, she’s the right age (though she looks a little older than 27 to me), she seems malleable, and she even has the correct measurements! Bounine and his cronies have been thorough: they found the royal dressmaker and got Anastasia’s measurements so they could make a handy life-size silhouette. It’s creepy. Also, Bergman looks so awful and ill at the beginning of this movie. Her transformation throughout the film is very well done. But Bounine is confident that they can mold Anna into Anastasia. They’ll teach her to talk, walk, and dress like a Grand Duchess, and they’ll fill her head with enough “memories” that she can fool the servants, relatives, and courtiers who escaped the Revolution. Conveniently enough, Bounine was a General and special aide to the Tsar, so he knows all the useful information about Anastasia and her family. After a while, Anna begins to show interest in the scheme. She is tired, suicidal, ill, alone, and poor, so the fact that she will get food and a place to live are very strong inducements. Plus, Bounine and his pals play on the fact that Anna yearns to find out who she is. She wants a family and an identity more than anything else, and if she gets it through a long con, that’s okay. The scene ends with Anna weeping against a picture of the Tsar and his wife, completely overcome. We get the first inklings that maybe she wants to be Anastasia, and that she thinks there’s a chance that she really is. Is she displaying the grief of a child for her parents and for a lost life, or is it the sorrow of a confused, identity-less, exhausted woman at the end of her strength? Bergman performs it brilliantly. This scene in the cellar seems to go on forever. There is a lot of information to get across, but mostly they just criss-cross the room and arrange themselves into pleasing groups as they chat. It’s very clear from this scene, and from most of the other ones in this film, that the source material was a play. There are only a few locations, and the majority of the scenes show static conversations. The lack of fluidity and movement doesn’t hurt the movie too much, since the conversations and plot are so fascinating and the performances are tremendous. But it’s something to watch for. They only have a few days before they need to present Anna to their stockholders, so they waste no time drilling facts, family trees, and memories into Anna’s head. Boris, Piotr, and Bounine are still mean to her, though. It seems that they would get much further if they showed a little compassion, but Bounine treats her like a disobedient child who needs to be whipped into shape. Just as in the cellar, sometimes Anna amazes the men with details about Anastasia and her family that they don’t remember teaching her. How does she know these things? We’re never sure. The film does a marvelous job keeping the audience guessing. Sometimes Anna’s strangely accurate “memories” can be explained, sometimes they can’t, and sometimes we just don’t know because we don’t see every moment of her Anastasia training. So when she pulls out some obscure detail about the summer palace, for instance, the audience isn’t always sure where that information came from. Bounine thinks that Anna is starting to believe that maybe she is Anastasia, but he refuses to discuss the possibility with her. It doesn’t matter to him, and he sees no point in such speculation. Better to focus on their goal. A few days later, Bounine invites some of their most important stockholders to see Anna. 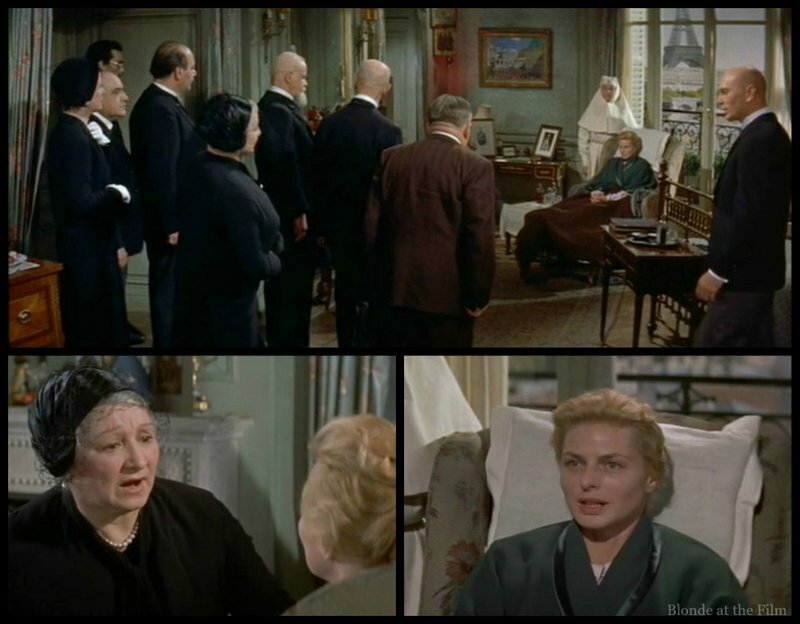 These include court officials, servants, and other Russian expats who are keen to see the “Grand Duchess.” Fun fact: many of the bit parts in this film were filled by actual members of the large Russian exile communities in Paris and London. This situation is similar to another of Bergman’s films, Casablanca, which featured actual refugees who had fled Europe playing refugees who had fled Europe. Bounine warns Anna to be silent–he doesn’t think that she is ready to undertake interviews, and they can plead her obvious illness and gain some more time. But when Anna sees an older woman, she beckons her closer and claims to recognize her as one of her mother’s ladies-in-waiting. Anna amazes the woman by using the pet name that the Tsarina used to call her! 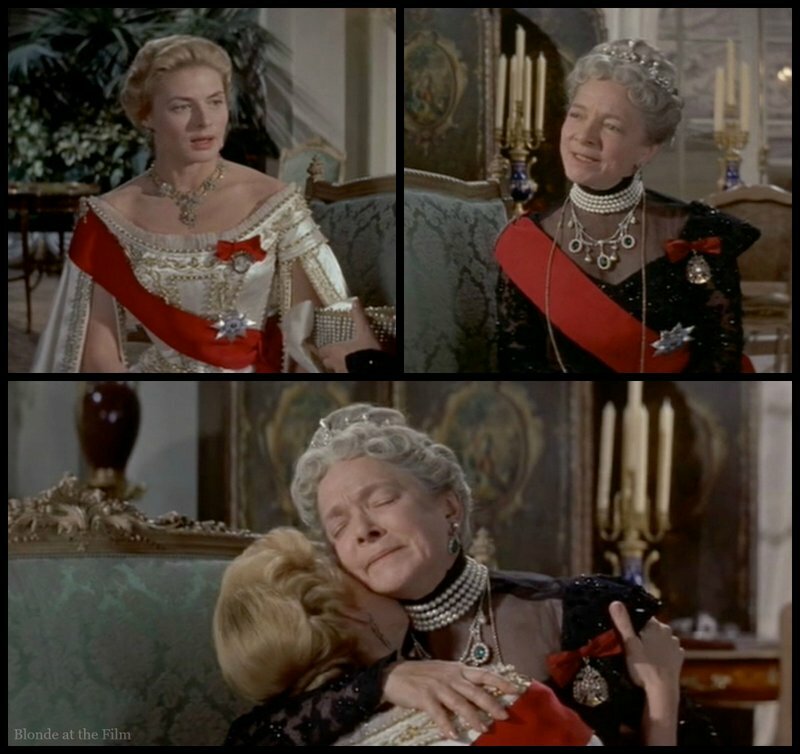 The woman is overcome, and bows to Anna, utterly convinced that it is truly Her Imperial Highness, the Grand Duchess Anastasia. This is one of those moments I was mentioning earlier. We didn’t see Bounine or his cronies telling Anna about this woman, so we don’t know if Anna is truly remembering something, or just doing a terrific job of repeating what she’s been told. Regardless, she’s proven she can convince people that she is Anastasia. After this meeting, Anna has a mini-breakdown because she is so confused. She doesn’t know what she remembers and what she has been told she remembers. Her real memories and Anastasia’s memories are becoming inexorably mixed, and it’s driving her crazy. She just wants to be who she actually is, whoever that might be! But Bounine brushes aside her very real concerns. Back to business! It’s time for dance lessons! That mini-breakdown and other such conversations keep Anna likable and very sympathetic throughout this movie. She’s not in it for the money, and her “impersonation” of Anastasia doesn’t seem mercenary or cruel because she genuinely doesn’t know if she is the Grand Duchess or not. She might be! There are enough strange coincidences that such an idea seems possible. Bergman plays the character as a very lonely, terribly confused woman who latches on to anything that seems real, but then has trouble determining where reality and facsimile end. You can see how a strong character like Bounine takes over, and someone like Anna finds it difficult to push back. Soon she is lost in his world, and her confusion only grows as she delves deeper into Anastasia’s life. Bounine needs the most important, powerful members of the Russian expat community to accept Anna as Anastasia, so he arranges a party where Anna will be on display and available for chats so that everyone can make up their own minds. And hopefully sign affidavits for the Bank of England swearing to Anna’s identity. This man with the excellent mutton chops is particularly skeptical. At first he refuses to even speak to Anna, and once he does, he tells her that nothing she can say will convince him. Only the bearing and behavior of a Grand Duchess will change his mind. As he turns to go, Boris lights up a cigarette. Anna snaps, “How dare you smoke in my presence without permission!” The mutton-chop man turns around with a shocked look on his face and asks her, “Who are you?” his voice full of wonder. Anna has succeeded again! A crucial switch has occurred for Anna by this point in the film. Before she was nervous and conflicted when she had to convince people of her identity, but now she’s angry. She believes she is Anastasia, a Grand Duchess, the daughter of a Tsar, and it infuriates her to have to “perform” for these skeptics. It’s degrading! So that’s an extra wrinkle. Despite Anna’s success and her newfound confidence and surety, Bounine knows they need more support to get their hands on the Romanov inheritance. 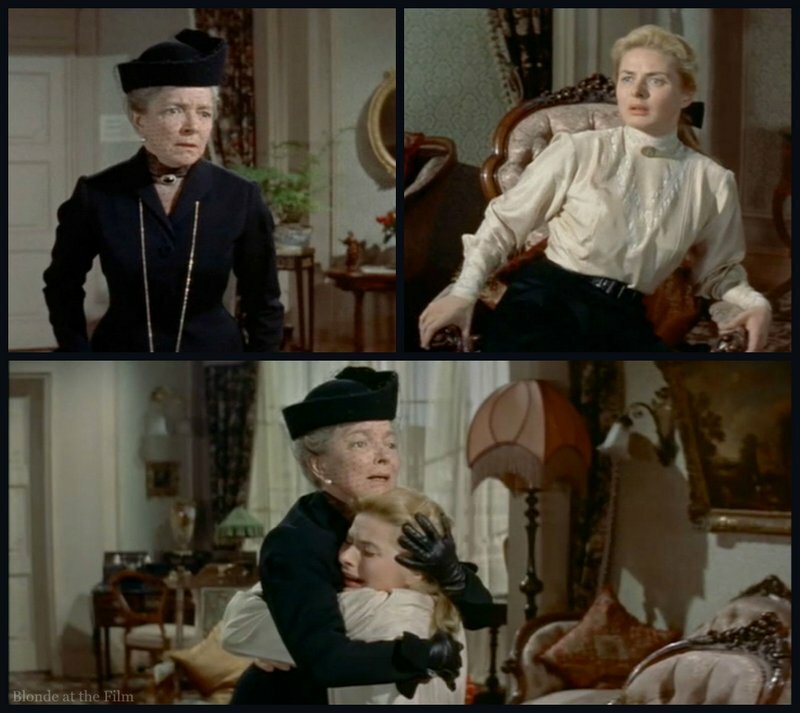 Their only option is to convince Anastasia’s paternal grandmother, the Dowager Empress Marie (Helen Hayes), that Anna is her long lost granddaughter. If they get the Dowager’s endorsement, no one will dare question Anna. But it will be tricky. First, the Dowager Empress lives in Copenhagen. And second, she refuses to see any Anastasias. She has been burned too many times, and it’s far too painful to hope and be crushed again. But Bounine and Anna go to Copenhagen anyway. He has a plan. Look at how bright and beautiful Anna looks compared to her sunken, sick appearance at the beginning of the movie! Being Anastasia suits her! Bounine meets with one of the Dowager’s ladies-in-waiting, Baroness von Livenbaum (Martita Hunt), at the Tivoli Gardens in Copenhagen. Fun fact: the production did go to Copenhagen to get background shots of various places, but most of the filming took place in Borehamwood Studios in England. Bounine gets the scoop on the Dowager, and learns that she only leaves her palace to see Russian ballets or concerts. Luckily for Bounine and Ana, Tchaikovsky’s “The Sleeping Beauty” is next on the schedule. (It’s a little on the nose; the princess who has been asleep/lost for years and finally re-awakens?) So off they go to the ballet! Anna is terrified, but not because she has to convince the Dowager. She’s terrified because she is so near to the only family she has left, but might never get the chance to close the distance. Remember that Anna’s reason for agreeing to this scheme in the first place was to gain an identity and a family. And she’s almost there! At intermission, Anna turns her significant charm on Prince Paul (Ivan Desny), a cousin and the man who Anastasia was engaged to before the Revolution. Paul is very close to the Dowager, so he is a good friend to have. Meanwhile, Bounine weasels his way into the Dowager’s private box. The fierce old lady tells him that there is no way she will see his imposter, and summarily dismisses him. Costume appreciation break. 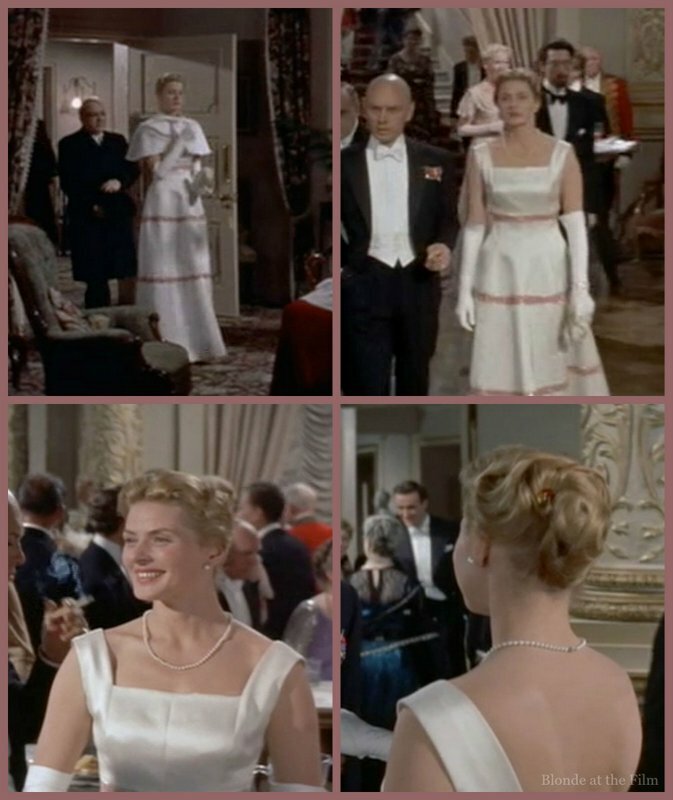 Bergman’s costumes are mostly utilitarian in this film, but this white dress with pink stripes is quite lovely. Rene Hubert designed the costumes, and he does a great job in the crowd scenes combining old-fashioned gowns like Anna’s with short, flapper styles. It is 1928, after all! A few days pass, and the Dowager still refuses to see Ana. But Prince Paul is delighted to take his pretty new friend/possible former fiancee out on the town. Bounine interrupts this particularly heated date. He seems jealous of Paul and the attention Anna pays him. When Bounine takes a drunk Anna home that night, he stands at the end of her bed and looks down at her. And that’s about as tender and romantic as this film gets. There are only a few days left on Anna’s visa when they get a surprise visit. The Dowager has come to see Bounine’s imposter after all. Paul now believes that Anna is Anastasia, and he begged the Dowager to talk to her. It’s an incredibly powerful scene, wonderfully played by two extraordinary actresses. First Anna tries to drop names and places, calling Catherine the Great by the Romanov family nickname, “Figgy,” for example. But the Dowager shuts that down. She’s not interested in anything that Anna could have been taught. She admits that the resemblance is strong, but remains highly skeptical. It seems that nothing Anna does can convince this battle-scarred matriarch. At one point, Anna embraces her “grandmother,” explaining that even if the Dowager never believes that she is Anastasia, at least Anna will have been granted one embrace with the family she thought she had lost. Remember that Anna really thinks she is Anastasia at this point, and she knows that this might be the last time she will ever be with her grandmother. See what I mean? Intense. But still the Dowager maintains her stony refusal. She turns to go, and Anna collapses in a chair, coughing quietly. The Dowager asks if she is ill, and Anna replies, exhausted, that she is not ill; she coughs when she is frightened. And that does it! The Dowager goes white and says that Anastasia used to cough when she was frightened! She had that quirk even when she was a little girl! In that moment, the Dowager believes, wholeheartedly, that her granddaughter has returned to her. It’s marvelous. But as she clutches Anna to her, she whispers, “If it should not be you, don’t ever tell me.” She wants to believe more than she wants the truth, much like Anna. And you don’t blame her. She thought her entire family was murdered, but now she learns that a granddaughter survived. Of course she wants it to be true! And the audience does, too! What a great story, right? Indeed, this film is a fascinating meditation on what happens when we simply will ourselves to believe something. If we want something to be true, we’ll grasp anything that supports it, and our reality will shift, no matter how “true” it might be. Fun fact: although this film is inspired by Anna Anderson, it doesn’t follow her trajectory too strictly. A major difference is that Anderson was never accepted by the Dowager Empress, nor by most of the other members of the Romanov family. Anyway, things move quickly once the Dowager Empress validates Anna as Anastasia. 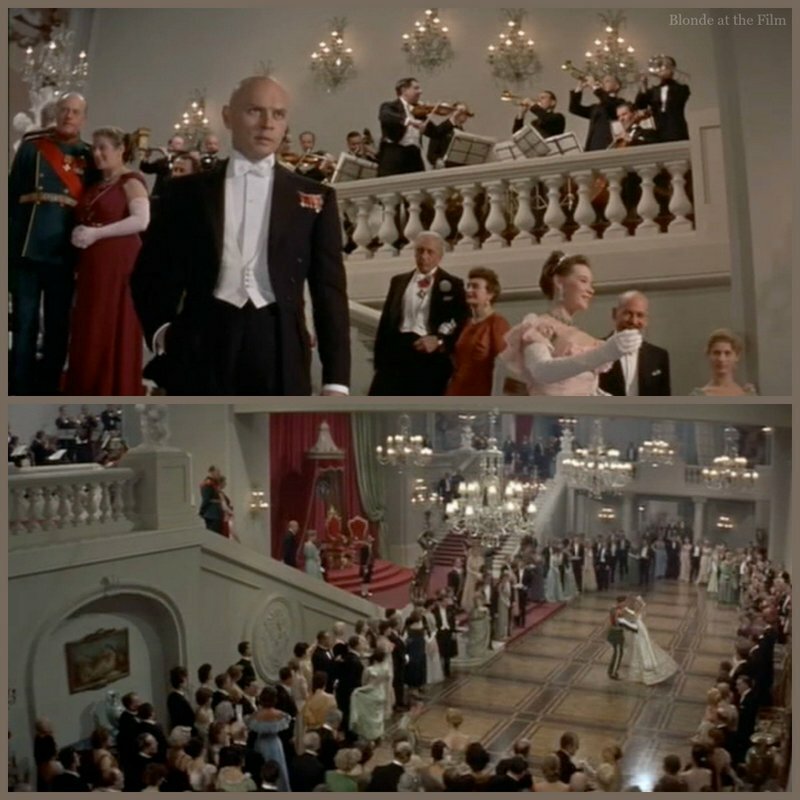 We cut to a spectacular ballroom where the Dowager Empress will officially recognize Anna as the Grand Duchess Anastasia, and also announce her engagement to Prince Paul. It’s a big night. But first, Bounine and Anna hold a press conference. 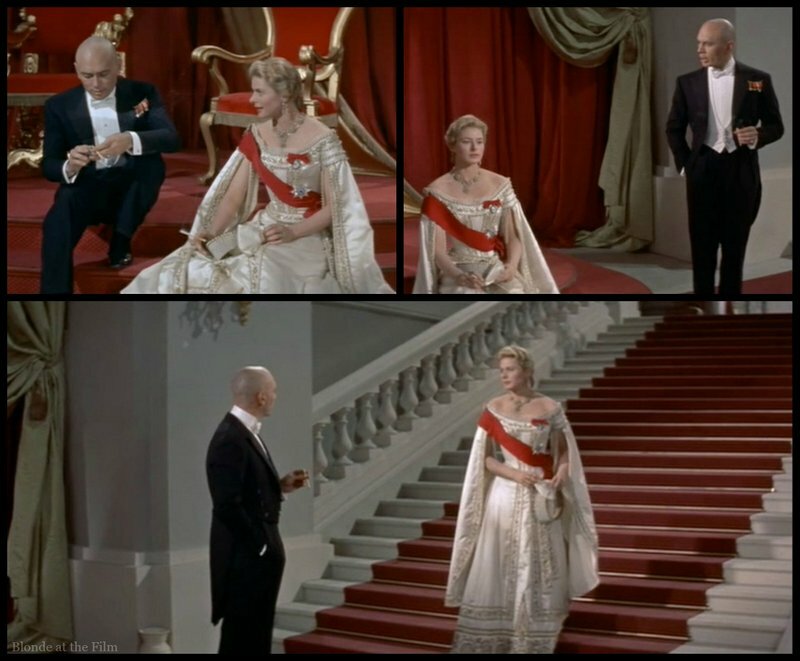 Anna descends the stairs in her Imperial court dress like the Grand Duchess she is about to become/has always been. The press conference has barely begun before a man emerges from the crowd and tells Anna that he knew her in a hospital in Bucharest several years ago. She had been injured in a train explosion (remember that she mentioned that in the cellar the first night), and that her name is Anna Koreff. Anna recognizes the man and admits to being in Bucharest, which sends the reporters into a frenzy. Though it really doesn’t prove anything either way. Anastasia could have been in a train explosion near Bucharest after 1918, too. Bounine ends the press conference abruptly and the reporters are ushered out. Anna is unnerved but not terribly so. She’s so different from the unstable, weak, terrified woman Bounine pulled back from the river’s edge! She and Bounine sit and talk, but he still refuses to tell Anna if he believes that she is Anastasia or not. He says that it doesn’t matter, and implies in his stern way that he would love her no matter what her name was. Unlike Paul, who would definitely not marry Anna Koreff. Their heart-to-heart ends in an argument, as usual. But their attraction is stronger than ever. After the botched press conference and the tense exchange between Bounine and Anna, the ball gets underway! Anna opens the dancing with her nearly-affianced prince. She asks him if he’d marry her if she wasn’t Anastasia, and he demurs, saying it doesn’t matter because she is! 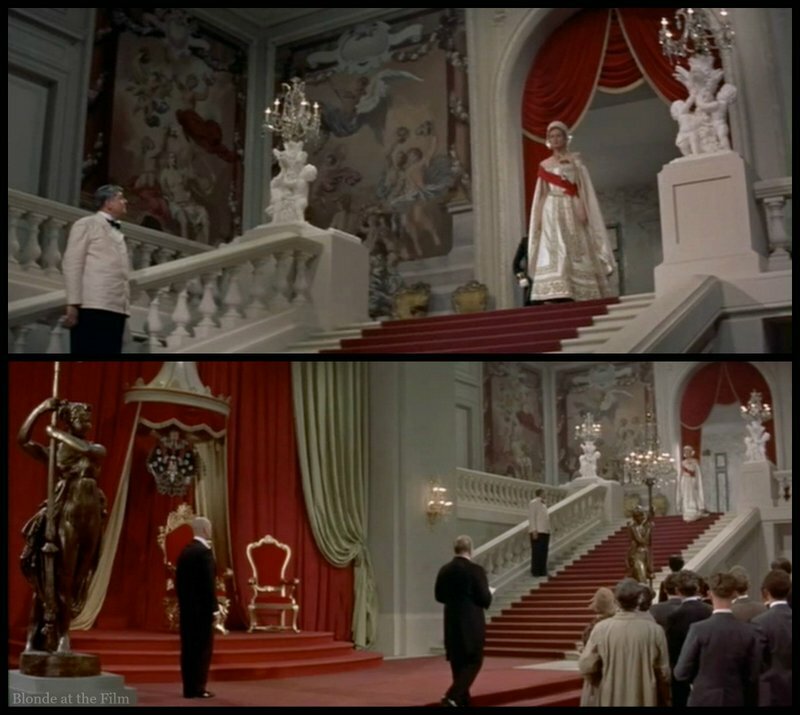 As you can see, the sets and costumes are incredibly lush in this film, and especially this scene. The production values pushed the budget up and up to a staggering 3.5 million dollars, and Fox claimed that it was the most expensive movie they had ever made abroad. There is talk all around the ballroom about how the good old days, the pre-Revolution, Imperial days, have returned. But Bounine and Anna don’t share in the giddy nostalgia. And neither does the Dowager, who is too wise to believe that the past can be resurrected after all these years and such monumental changes. 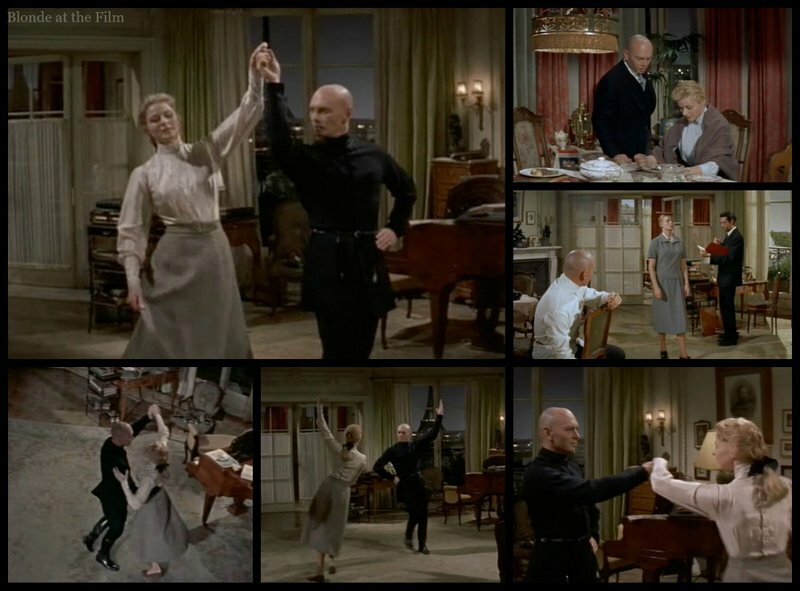 After watching Anna dance with Paul, Bounine requests an audience with the Dowager so he can make his goodbyes. He isn’t going to stay to see Anna crowned as Anastasia. Which is odd, because that was his goal all along. The Dowager guesses that Bounine is in love with Anna. She’s a savvy lady! She asks him to stay just a little longer, and sends him to wait in the “green room” (not a TV show’s waiting area, but a nearby chamber with green walls.) He obeys. 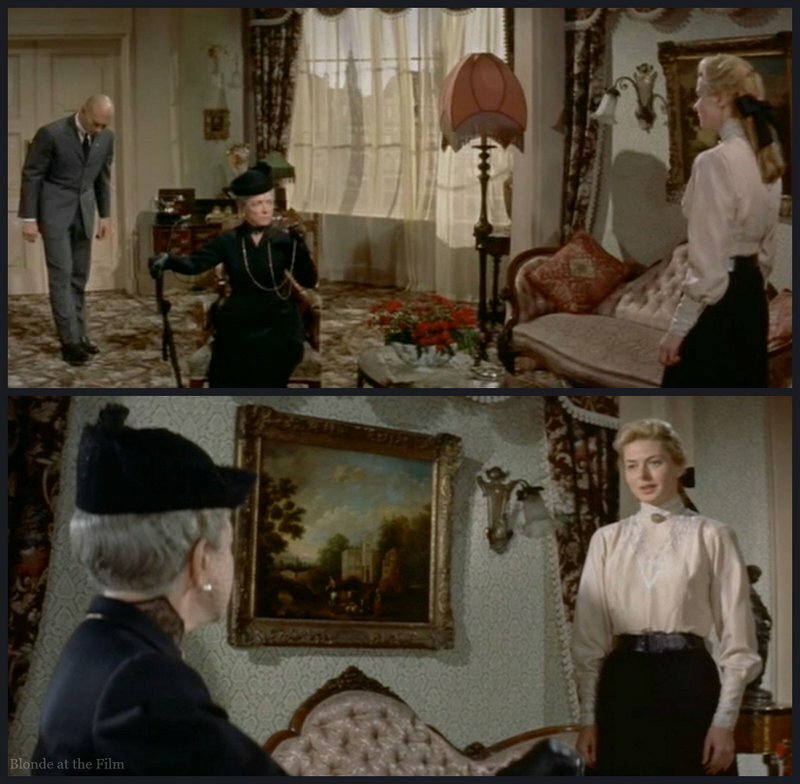 After her waltz, Anna goes to see the Dowager. They have a beautiful grandmother-granddaughter chat about who and what Anna really wants (not a life as Anastasia with Prince Paul, but a simpler one as Anna with Bounine). Of course, they don’t actually say that, but it runs beneath the conversation. The Dowager realizes that Anna doesn’t truly want to be Anastasia, even if she really is. The Dowager hugs her tight, for what she knows is the last time, and sends her into the green room. Well played, Grandmama. 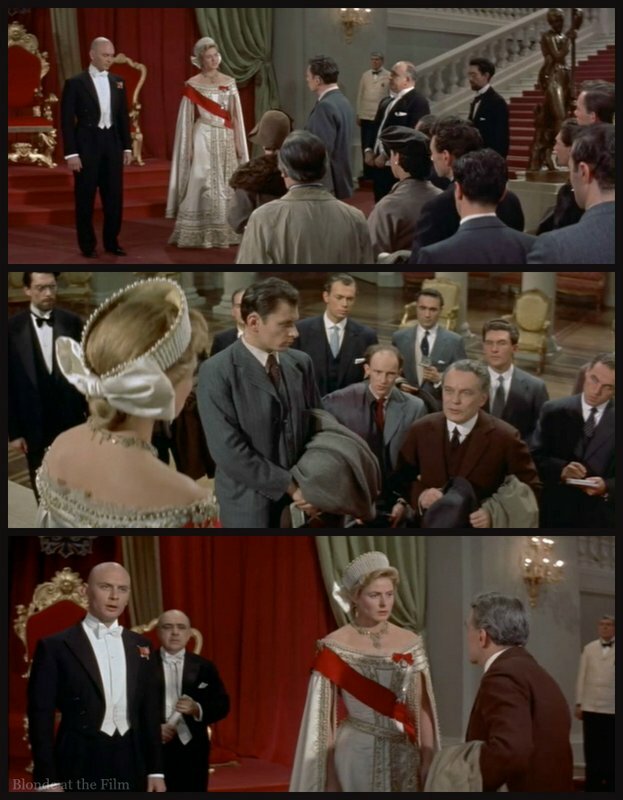 A few minutes pass and it’s time for the formal presentation of the Grand Duchess Anastasia. But she is nowhere to be found! And Bounine is gone, too! The Dowager seems delighted by this turn of events even as everyone around her panics. The true identity of Anna is never established, though I think the film wants us to believe that she is Anastasia. It makes for a delicious tale, especially with the surprise ending. Anna’s decision to reject life as a Grand Duchess only makes us like her more because she has proven that she was never in it for the money and the fame. She just wanted love and an identity, and she found it! Anatole Litvak has smartly staged it for a fine projection of its human ironies. 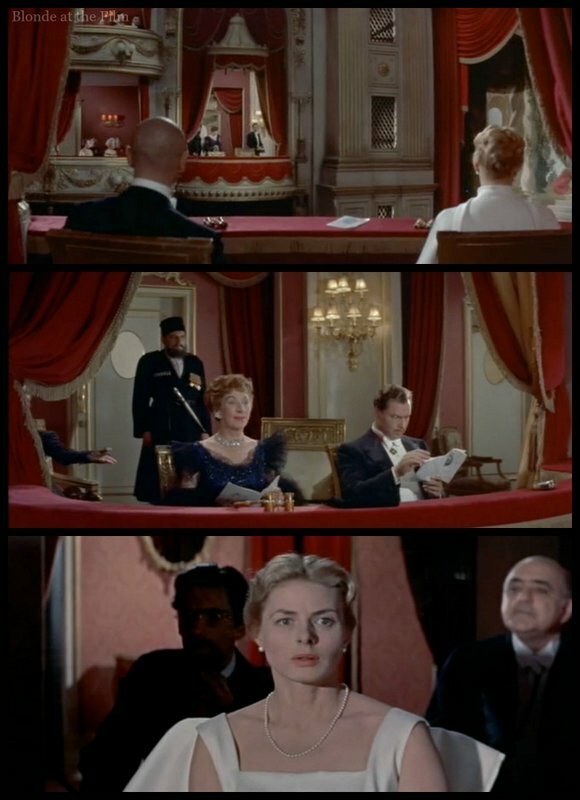 And it is played with keen sensitivity by Ingrid Bergman, Yul Brynner and Helen Hayes…If the ending is slightly ambiguous and touched with a gloss of sentiment that may be generously forgiven in gratitude for what has gone before. 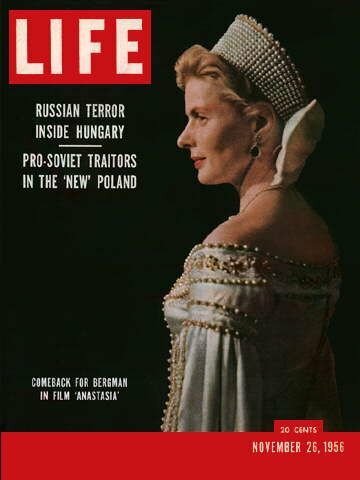 And as for scandalous Ingrid Bergman? Miss Bergman’s performance as the heroine is nothing short of superb as she traces the progress of a woman from the depths of derangement and despair through a struggle with doubt and delusion to the accomplishment of courage, pride and love. 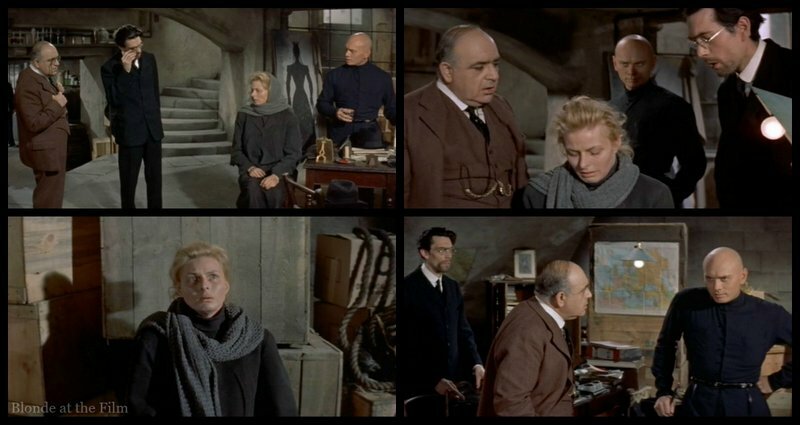 It is a beautifully molded performance, worthy of an Academy Award and particularly gratifying in the light of Miss Bergman’s long absence from commendable films. This film was a terrific comeback for Bergman. She won the New York Film Critics Circle Award for Best Actress, which she accepted in person, marking the first time she had been in the United States since 1949. 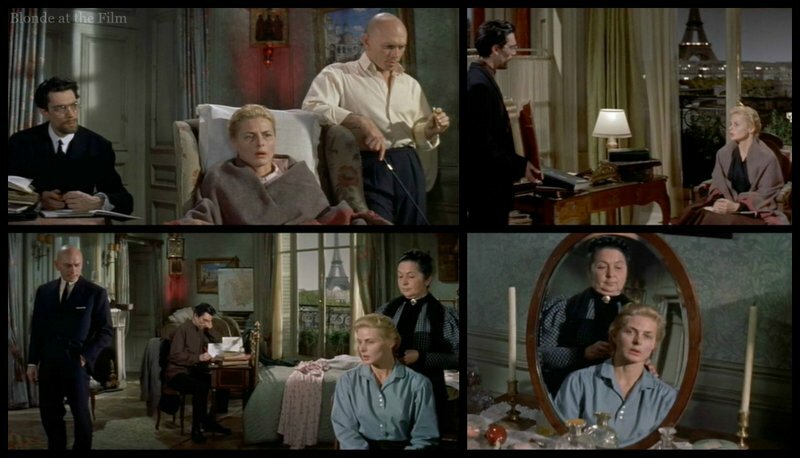 And as Crowther predicted, Bergman won the Best Actress Oscar, her second such prize after 1944’s Gaslight. She would win her third Academy Award, this time for Best Supporting Actress, in Murder on the Orient Express (1974). You can watch Ernest Borgnine present the Oscar and Cary Grant accept it on Bergman’s behalf. Bergman wouldn’t make a public appearance in Hollywood until the next year’s Oscars in 1958, when she was introduced by Cary Grant and received a standing ovation. The “agent of evil” had been forgiven and welcomed back into the fold. Fun fact: a very loose adaptation of this story became an animated film in 1997. In a cool twist, David Newman, Alfred Newman’s son, composed the music for that Anastasia. And now to ruin the mystery…Anna Anderson died in 1984, and DNA tests proved conclusively that she was not related to the Romanovs, but instead was a Polish woman named Franziska Schanzkowska. All of that is irrelevant, now, though, because in the 1990s and 200os, when the graves of the Tsar and his family were finally discovered after nine decades of secrecy, DNA testing in 2007 proved that all seven members were accounted for. Anastasia didn’t survive the massacre, after all. Here’s the trailer of Anastasia–enjoy! For more, follow me on Twitter, tumblr, Instagram, pinterest, and Facebook. And you can buy this classic movie here –or go see it at TIFF Bell Lightbox! As always, thanks for reading! Great review as always. And thank you for the video links. I must immediately watch this film again! Thank you! It’s a great movie! Another good post, Ms Film. BTW, “Anastasia” is Greek for “resurrection,” so the title has a bit of a double meaning. Thank you! And thanks for that great tidbit about the title! You are correct to use the spelling Tsar, as the Russian spelling and pronunciation is a consonantal cluster not used in English, that is “ts” roughly pronounced “tsuh.” The English use of Czar is our language’s attempt to approxomate and pronounce the cluster, which is an unnatural sound for English speakers.